You’re here all the time any way! Why not be rewarded? 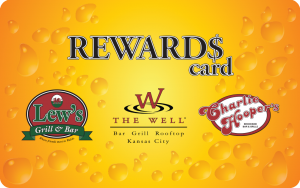 Receive a $10 instant reward for every 200 points, free drinks & appetizers, birthday & anniversary rewards, game day discounts & double points days, VIP perks & free covers and much more! Rewards may be earned on every purchase you make and are accepted at The Well Bar Grill and Rooftop, Lew’s Grill and Bar and Charlie Hooper’s Bar and Grille. calendar of events and rewards!